UNITED NATIONS, Apr 18 2015 (IPS) - Despite commitments by the international community to achieve universal primary education by 2015, funds for education have been decreasing over the past ten years, according to a report released Friday by the global advocacy campaign ‘A World at School’. Figures from a Donor Scorecard show that nine of the top 10 donor governments, including the United States, the United Kingdom, Germany and France, have been reducing their aid since 2010. Norway is the only major donor that showed a five-percent increase in education funding over the past four years. The scorecard will be presented on the first day of the World Bank and International Monetary Fund (IMF)’s spring meetings, scheduled to run from Apr. 17-19 in Washington DC, to highlight the need for international financial institutions (IFIs) to target their funds towards nations with the most number of out-of-school children, and specifically towards hard to reach populations. According to the report, “In 2011, the bank provided 20 percent — the smallest share — of its total aid to basic education to low-income countries. 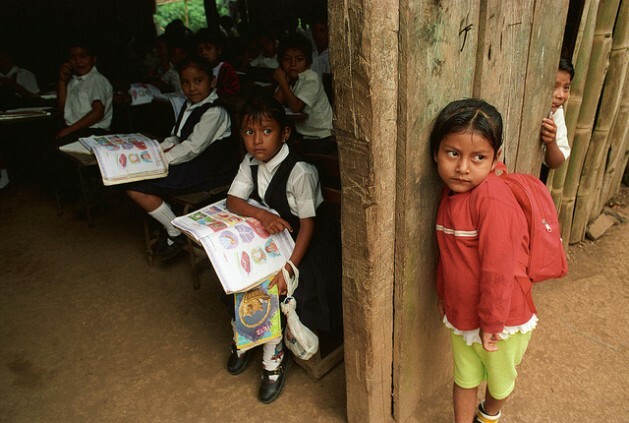 More than 70 percent of funding went to countries with less than 20 percent of the out-of-school population. According to the Donor Scorecard, while investments in health have risen by 58 percent, those in education have fallen by 19 percent. The report comes in the wake of worldwide “attacks” on education in 2014 and 2015, with war, conflict and terrorism destroying schools and interrupting the education of thousands of school going kids in places like Kenya, Pakistan, Syria, the Central African Republic and Gaza. The kidnapping of students in Nigeria and South Sudan are also major causes for concern. According to a report released recently by the United Nations Educational, Scientific and Cultural Organisation (UNESCO), about 58 million children are out of schools, and 100 million children do not complete primary education. The UNESCO document also says education is still under-financed, affecting the poorest children, as many governments are not prioritising education as part of their national budgets. There is an annual financing gap of 22 billion dollars over the 2015-2030 period for achieving quality pre-primary, primary and lower secondary education in lower- and middle-income countries, the report stated. Campaigners with A world at School are calling for concrete aid strategies for basic education, which include the creation of a humanitarian fund for financing education in emergencies, and increasing aid initiatives for children in war-torn countries.